According to a new report by the American Academy of Pediatrics (AAP), drinking alcohol while pregnant could lead to lifelong cognitive and behavioral issues. While previous studies have hinted that a little bit of alcohol consumption during pregnancy may be harmless, the AAP has issued a new warning that no amount of drinking is safe while pregnant. The new report, published online today in the journal Pediatrics, suggests that there is no safe trimester to drink alcohol and that all forms of alcohol, including wine and beer, pose similar risks. The report further states that binge drinking poses a higher risk in line with the excess amount of alcohol consumption. Binge drinking in women, according to Williams, is defined as drinking four or more drinks in the span of two hours. Commenting on previous studies that suggest drinking a small number of drinks while pregnant is safe, Williams explains that these studies actually don’t conclude that alcohol is safe. Instead, they show that based on specific participants and conditions, the evidence that alcohol exposure is the attributable factor is insufficient. However, despite the new research, Williams suggests that many women tend to rationalize their alcohol consumption while pregnant, believing that it’s either too low or infrequent enough that it’s a non-factor. Both Williams and Chambers note that alcohol consumption is risky during all stages of pregnancy, although neither would state that the risk is higher in certain stages. 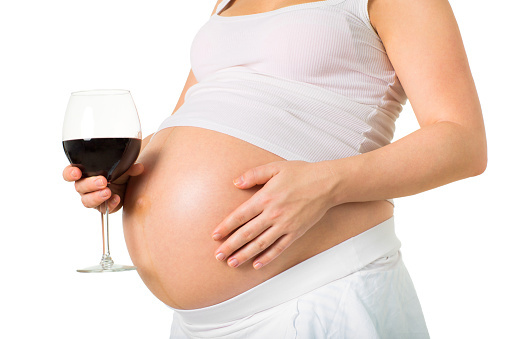 Physicians have been warning about the hazards of drinking while pregnant for decades. Yet, nearly half of all women of childbearing age in the U.S. have reported that they consumed alcohol within the last month while nearly eight percent continue to drink alcohol during pregnancy. Dotinga, R., “No Amount of Alcohol Safe During Pregnancy, Doctors Say,” Medicine Net web site, October 19, 2015; http://www.medicinenet.com/script/main/art.asp?articlekey=191281.